Styling and taking care of your wig or extensions can be hard work!! 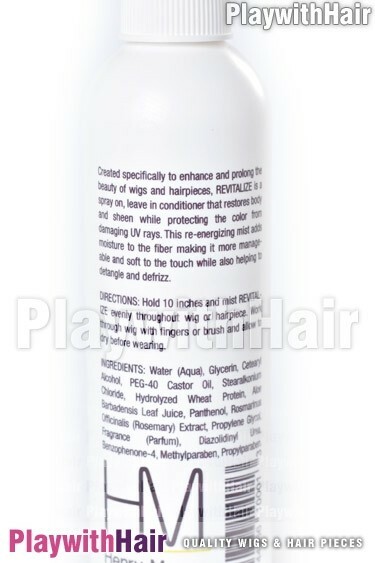 This stuff is gold for keeping your hair looking and feeling superb between washes, and wont damage your wig like aerosol sprays can - they contain alcohol which dries and ruins your wig! If you use the wrong products, you can do some long term damage to your hair, and it certainly will not last as long. Our Wig Revitalising Mist is simply stunning and smells delicious!! Clients who have ordered come back time and time again for more... Once your wig starts to feel a little tired and worn, a quick wash and rinse and finger style with this helps them back to life!! A new healthy sheen appears, the fibres join together properly and the wig itself feels and looks sensational. It has a thickness back in the hair that makes it so simple to restyle!! This stuff is heaven in a bottle, and its made by one of the best wig companies in the world - ONLY for WIGS! None of this cheap spray which hurts your hair with product build up in the long run. Grab some now and try it for yourself, it works like magic!